Do you remember Ali who arrival in Beijing on March 3rd, 2014? What did he experience in the first week in China? 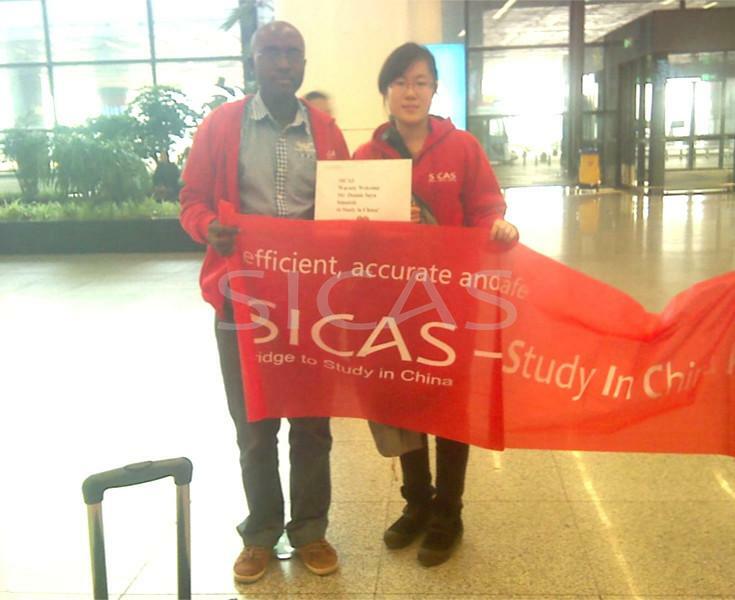 The following is selected from SICAS Student Service Team Member Summer`s work diary. Let`s follow and take a look. Ali came out. We found each other almost immediately. We chatted happily on the way to university. Ali`s feeling: He thought Beijing is really big and beautiful, except the weather is a little cold for him. After arrival at the university, we went to the teacher`s office to register. Ali`s instructor chose a Chinese name for Ali, called "阿里" and gave Ali his student number and class number. After dinner, we went to his dormitory, placed his luggage and helped him put things in order. There are two public kitchen so Ali can cook by himself. Ali feel a little tried today. We say goodbye and let him have a good rest. We accompanied Ali to complete police registration . We have prepared required document before departure, everything goes well. We finished at about 10:30AM. Then we went to the bank. Ali changed dollars to RMB and successfully opened an account. For some security reasons, we were not allowed to take pictures. We went to China Mobile and Ali bought SIM card there. We also bought an IP card because it`s much cheaper to use it make an international call. I helped him activate the IP card. He was very happy to call his family and told them he was safe here. Ali does not eat meat, so I bought him some potato and scrambled egg with tomato. I also bought two dishes without meat, we shared together. Ali`s feeling: He thought Chinese food is okay and he would like to try more. Ali did not went out today so we accompanied Ali to the supermarket in the university, he bought some toiletries and something to eat. We took him visit the campus and then to the Teaching Building. We showed him his classroom. Ali`s feeling: He thought the University is big and beautiful, and he would have a good time here. We went to the copy room near the building and copied the materials for Ali`s Chinese Class. Ali had his first Chinese class in the afternoon. On the evening when I picked up Ali for dinner, Ali said "xie xie" ( Editor`s note: "Xiexie" means "Thank you" in English ) to me for several times which makes me feel warm. Ali is a boy not talkative but very nice and trust in me. In the past days, although we went from place to place and were busy with registration on campus, completing police registration, applying for SIM card, debit card and other things, I am always feel meaningful to help Ali and students who come to study in China like him. And I sincerely hope Ali achieved both his academic success and happiness in China.